Family Therapy with Muslims is the first guide for mental health professionals who work with Muslims in the family therapy setting. The book opens with a section defining the similarities across Muslim cultures, the effects of postcolonialism on Muslims, and typical Muslim family dynamics. 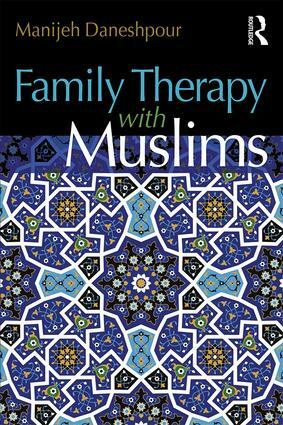 The author then devotes a chapter to different models of family therapy and how they can specifically be applied to working with Muslim families. Case studies throughout the book involve families of many different backgrounds living in the West—including both immigrant and second generation families—that will give professionals concrete tools to work with clients of their own. Manijeh Daneshpour, PhD, LMFT, is a professor in the department of couple and family therapy at Alliant International University in Irvine, California, and a licensed marriage and family therapist with 20 years of academic and clinical experience. Dr. Daneshpour’s main areas of research, publications, and presentations have been centered on issues of multiculturalism, social justice, third wave feminism, premarital and marital relationships, and Muslim family dynamics. She has studied Muslim families not as a religious group, but as individuals, members of family units, and a distinct group within their own societal context.